What if our most intense moments of suffering are also doorways to an abiding peace? Join Eckhart Tolle for a seminar on how to turn the light of awareness on the experience of pain and discover the always-available balm of Presence that lies behind it. To be human is to suffer. 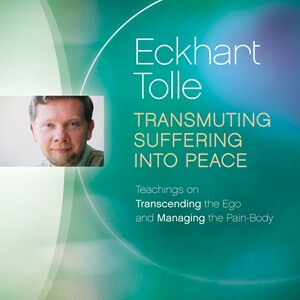 Whether it is brief annoyance or a life-altering cataclysm, everyone will encounter suffering—and yet, according to Eckhart Tolle, all of these painful moments contain an opportunity for awakening. InTransmuting Suffering into Peace, this celebrated teacher offers a new perspective on the ego and what he terms “the pain-body”—all the accumulated emotional wounds that follow us through life. Though the pain-body can easily rise up and hijack our consciousness with unpleasant emotions, in this program Eckhart reveals a hopeful truth—by turning the light of awareness on our suffering, that suffering becomes a powerful gateway to Presence. In the words of Eckhart, “The less you personalize the pain you feel and associate it with a story in your head… the more quickly it becomes transmuted. It becomes fuel for your consciousness.” With Transmuting Suffering into Peace, you will discover just how even our most challenging experiences can become openings to a richer and more grounded life.